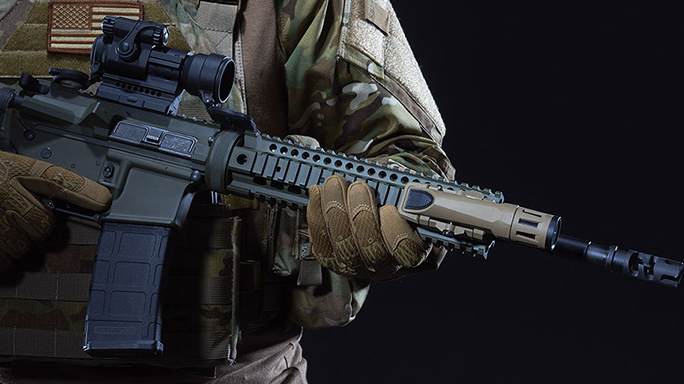 We've rounded up some of the best tactical AR lasers and lights from Viridian, Surefire, Crimson Trace and more to help you gain every possible advantage. 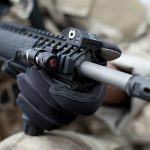 AIM Sports 500-Lumen Flashlight: The 500-Lumen Flashlight can be used as a standalone unit or mounted to a rifle. 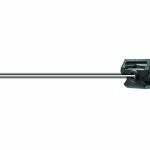 It features an integral belt clip for handheld use and a 45-degree offset mounting ring that attaches to any Picatinny rail. It can be used in both constant and strobe modes. Finally, the light comes with a pressure switch and cord, and it weighs only 8.7 ounces with its hardcoat anodized aluminum housing. 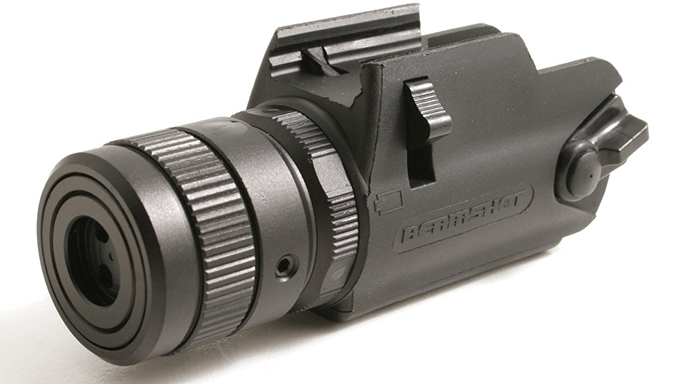 Barska Front Sight With Integrated Red Laser Sight: The name says it all on this product. 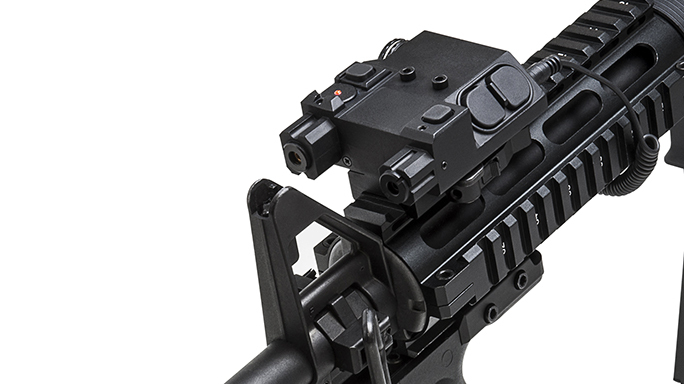 It’s an A2-style base with a windage- and elevation-adjustable front sight post and a red laser unit. The sight post is protected by wings. The laser is activated by a pressure switch and runs on three LR44 batteries. 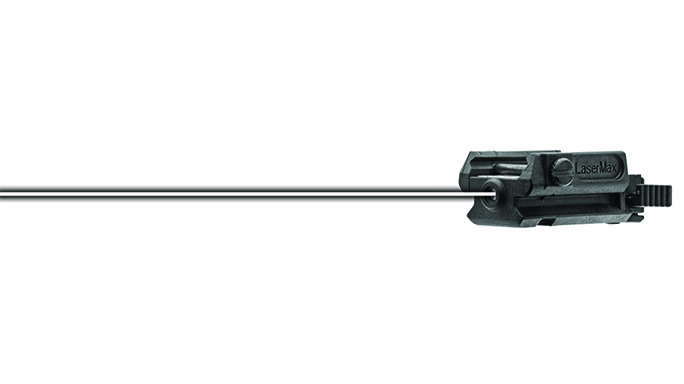 The unit easily attaches and detaches to Picatinny rails. 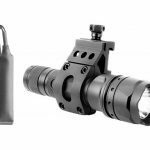 Beamshot BS8200S Tri Beam Laser: The BS8200S Tri Beam Laser sighting system emits three dots in a triangular pattern with the center of the three dots being the point of impact. 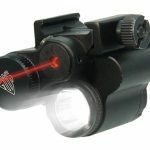 According to Beamshot, this pattern allows the eye to locate the threat’s center-mass much quicker for rapid targeting in close quarters. 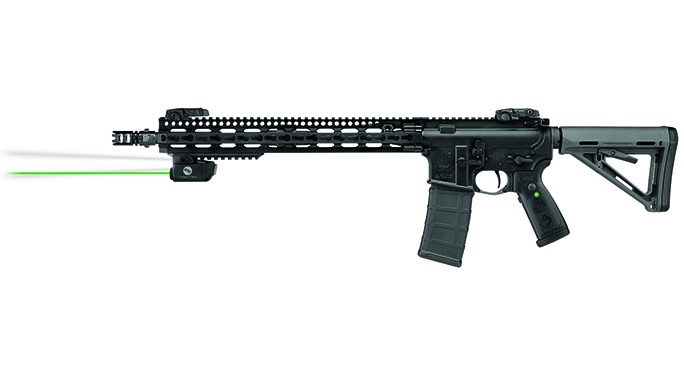 Beamshot X1-G: The X1-G green laser is lightweight and compact so it only takes up a little space on your AR’s rail. The laser has four modes: constant on, 2 Hz, 4 Hz or 8Hz pulse. 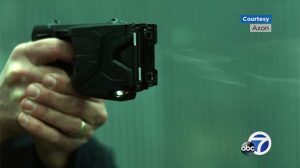 You can adjust the laser in 0.5-inch increments at 25 yards. The unit is powered by two AAAA batteries that provide about 1.5 hours of run time. 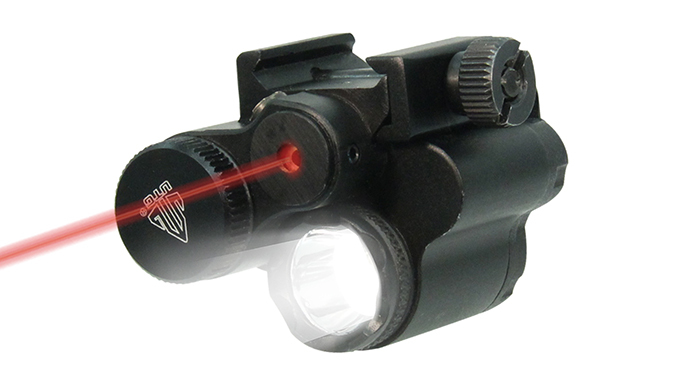 CenterPoint Compact Red Laser: The economical Compact Red Laser features a pressure switch and cord as well as a mount that allows it to be attached to any Picatinny/Weaver-style rail. 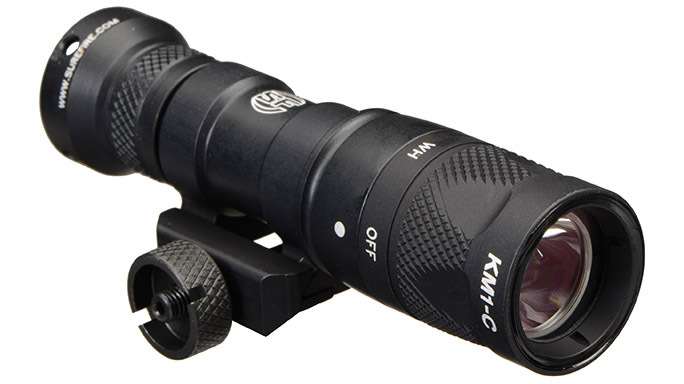 The laser can be seen out to 100 yards at night and up to 25 yards in daylight. 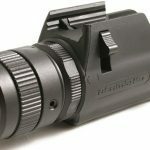 Crimson Trace LiNQ System: The LNQ-100G, or LiNQ, pairs a green laser sight with a 300-lumen LED white light in one rail-mountable unit. 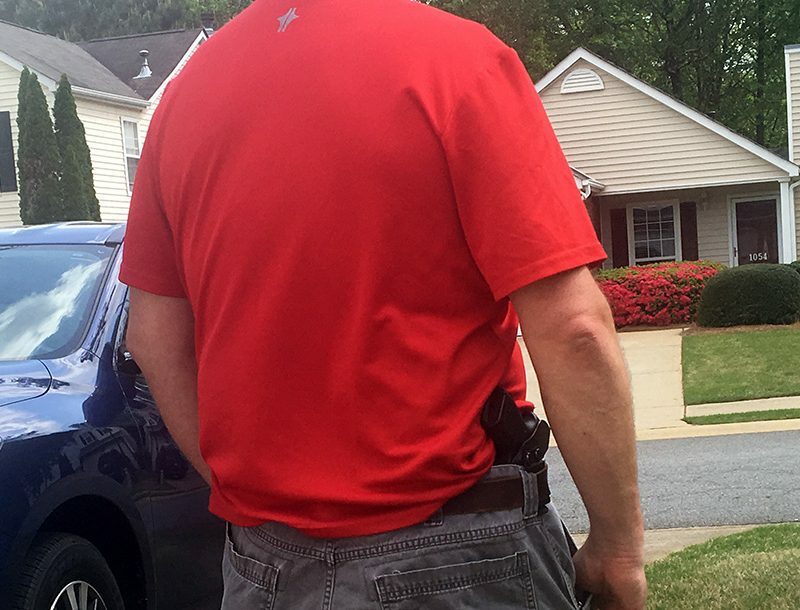 The neat feature here is the fact that the light/laser unit is controlled wirelessly by the replacement pistol grip. The system offers four modes of operation: laser and light, laser only, light only, and laser and light strobe. 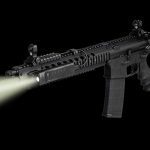 Inforce WMLx White/IR: The WMLx White/IR from Inforce punches a hole in the darkness with a 700-lumen LED white light, and flipping a lever allows you to switch to infrared mode. The light can also run in constant, momentary and strobe models. The unit weighs less than five 7.62mm NATO cartridges. Powered by two CR123A batteries, the white light runs two hours and the infrared mode offers four hours of power. The WMLx White/IR is also waterproof and can be mounted on Picatinny rails. 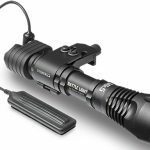 LaserMax Manta-Ray: The LaserMax Manta-Ray is a rugged, ultra-lightweight, rechargeable 140-lumen tactical light that snaps on and off a Picatinny rail without the need for tools, levers or clamps. The light beam is “mint” green LED light technology, which offers superior performance in close quarters and guards against reflection caused by higher-output white lights. 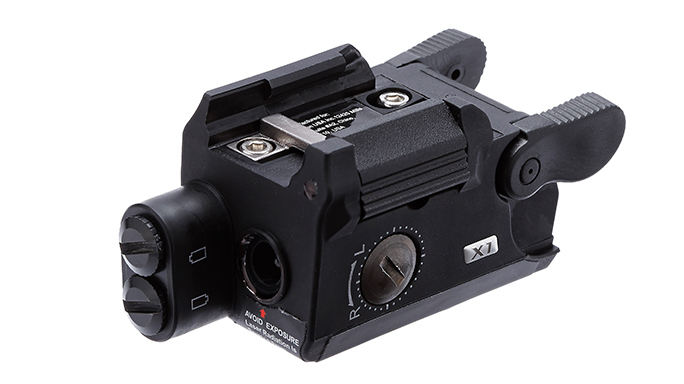 LaserMax UNI-IR-RVP: The UNI-IR-RVP unit is one of the smallest and lightest infrared lasers available. Its footprint only takes up 1.75 inches of rail space, and it’ll run for six hours on two 357 silver-oxide batteries. 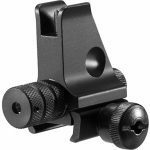 The UNI-IR-RVP quickly mounts to any Weaver- or Picatinny-style rail. 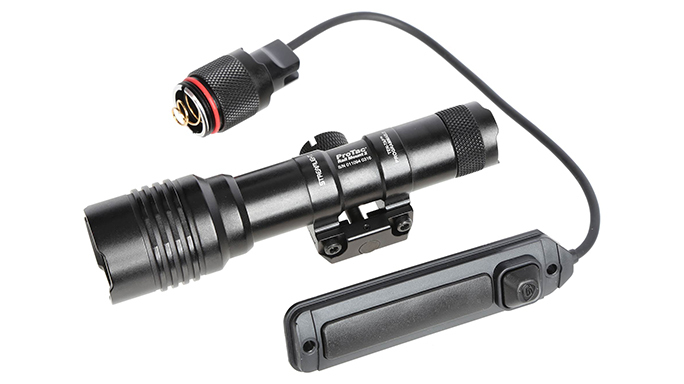 MFT Torch Backup Light Series: Extremely compact and super light weight, the Torch Backup Light series from Mission First Tactical (MFT) offers three models that feature 20-lumen lights while weighing about 0.8 ounces and measuring 2.2 inches long. The TBLW features a white light, the TBLWR features white and red lights, and the TBLWR features red and IR lights. 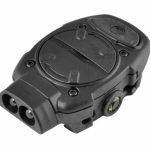 They each use one CR2016 battery and are designed for low-profile mounting to any Picatinny rail. 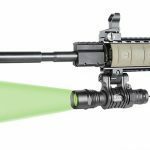 NcSTAR Green & IR Laser With Quick-Release Mount: The NcSTAR Green & Infrared Laser with Quick-Release Mount features a fully adjustable green laser on the left pod and a fully adjustable infrared laser on the right pod. 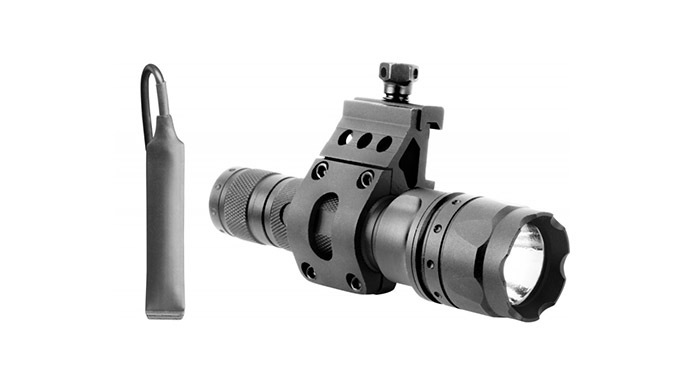 Both the Class IIIa laser and infrared designator can be activated in three different ways: a 45-degree momentary switch, a top-mounted on/off switch, and a remote pressure switch. The unit is powered by a CR123A battery and can easily be installed on a Picatinny rail thanks to its quick-release mount. 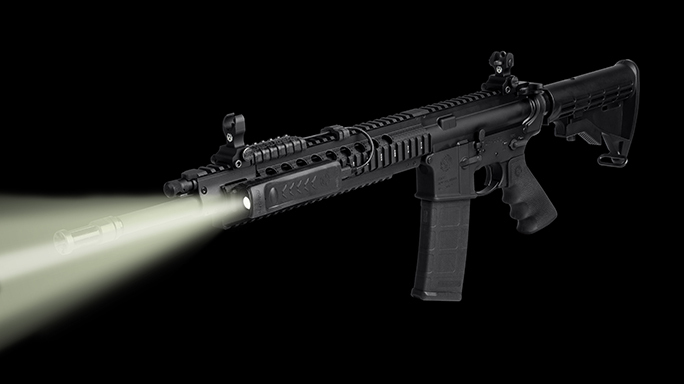 Steiner Mk5 Battle Light: The Mk5 Battle Light from Steiner Optics offers 800 lumens of white light to illuminate up to 500 meters away. 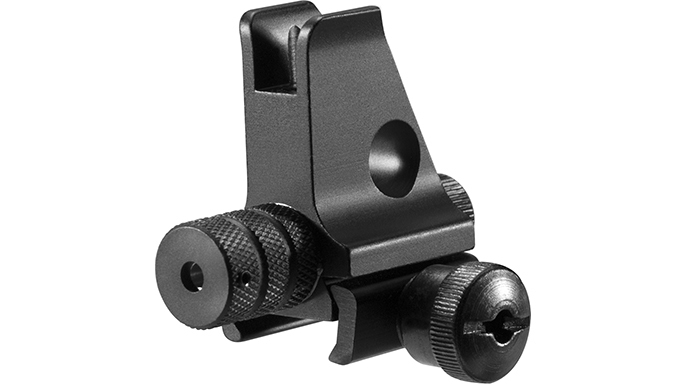 The Mk5 has a rugged aluminum housing with a matte black finish, and it can be used on its own or mounted to a weapon. 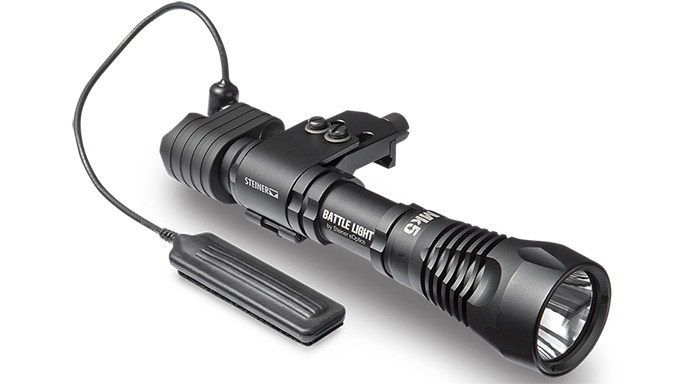 The light is powered by two CR123A batteries and features constant-on and momentary modes. 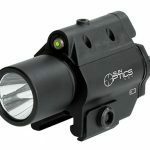 Pair it with a Steiner Low-Profile Offset Mount and this handheld flashlight integrates with any AR with a Picatinny rail. The unit is activated by a push button and is compatible with an optional remote switch. 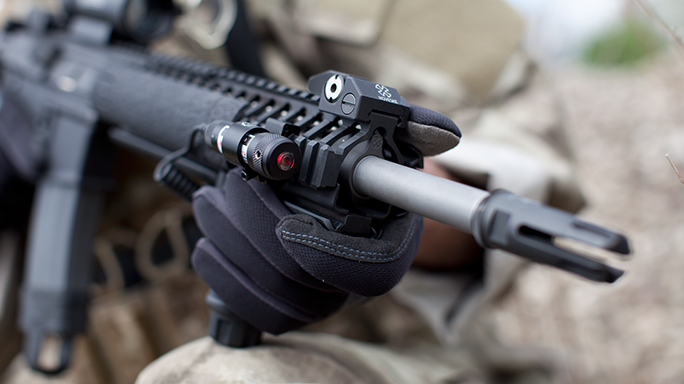 Streamlight ProTac Rail Mount 2: The ProTac Rail Mount 2 produces a 625-lumen light for weapon-mounted applications. 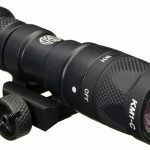 The flashlight features a dedicated fixed mount for Picatinny rails and uses either a remote switch or a standard push-button tail switch. It can also run in high/strobe, high only and low/high. It has a run time of 2 to 21 hours on two CR123A batteries. The units weighs 5 ounces and is only 5 inches long. 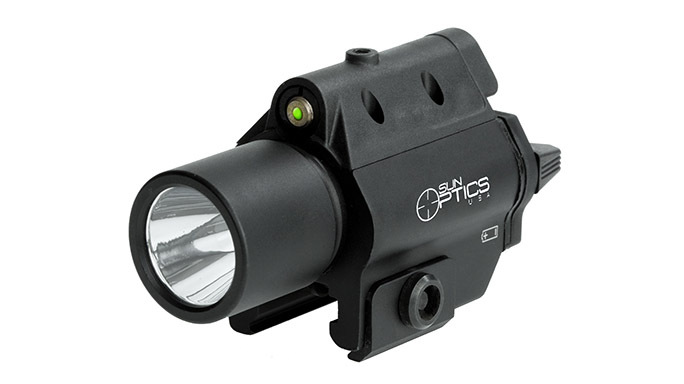 Sun Optics CLF-CLSG Compact Laser/Light: The CLF-CLSG Compact Laser/Light combines a 750-lumen LED light and a 5mW green laser to pinpoint a target. 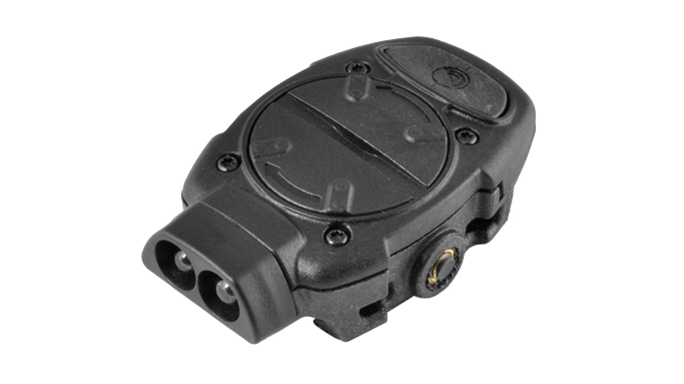 A three-position activation switch allows you to use only the light, the light and laser, or only the laser. The built-in mount is compatible with most rails systems. 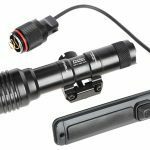 SureFire M300V-IR Scout Light: The ultra-compact SureFire M300V-IR Scout Light produces a 250-lumen LED white light or 100 milliwatts of non-visible infrared output. The light features two modes—momentary and constant-on—that is activated by a push-button tail-cap switch. 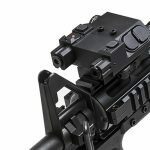 To switch from white light to infrared modes, the operator pulls and then twists the front knurled portion of the bezel. The light features a high-strength aluminum housing as well as weatherproof O-ring and gasket seals. It runs on one CR123A battery. UTG Subcompact LED Light & Adjustable Red Laser: The multi-functional Subcompact LED Light & Adjustable Red Laser unit from Leapers/UTG combines a 120-lumen white light with a fully adjustable red laser. The unit can be operated by direct push buttons as well as an included pressure switched. 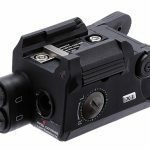 The unit is equipped with an integral Picatinny rail mount and runs on one CR2 battery with a combined light/laser run time of 45 minutes. 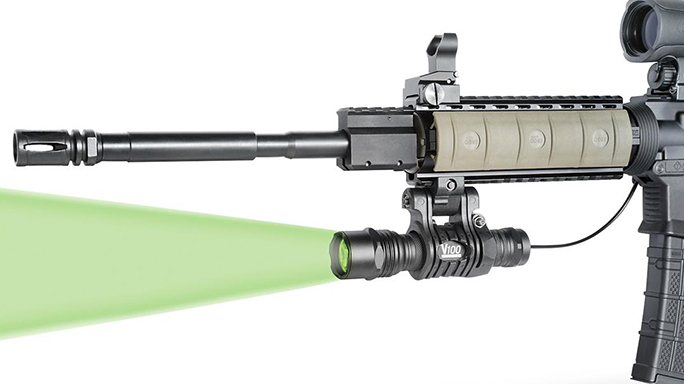 Viridian V300: The V300 is designed as a long-range, weapon-mounted illuminator. The green light will not spook game when hunting in the dark. 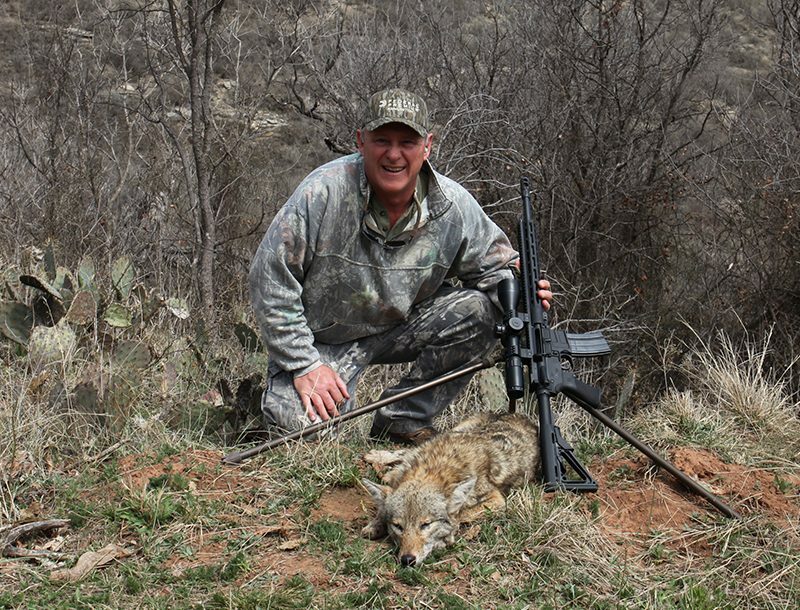 The unit features PowerZoom focus technology controlled by the built-in remote touch pad for a range out to 370 yards. With its hardcoat anodized aircraft-grade aluminum housing, the V300 runs on two CR123A batteries and mounts to any Picatinny rail. Illumination is critical in a defensive situation, since you need to be able to identify friend from foe. 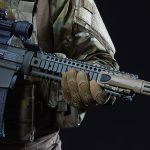 Thankfully, AR lasers and lights can punch holes in the darkness, and today’s handguards—whether they have Picatinny rails, KeyMod cutouts or M-LOK slots—make it easy to install these devices in just moments. 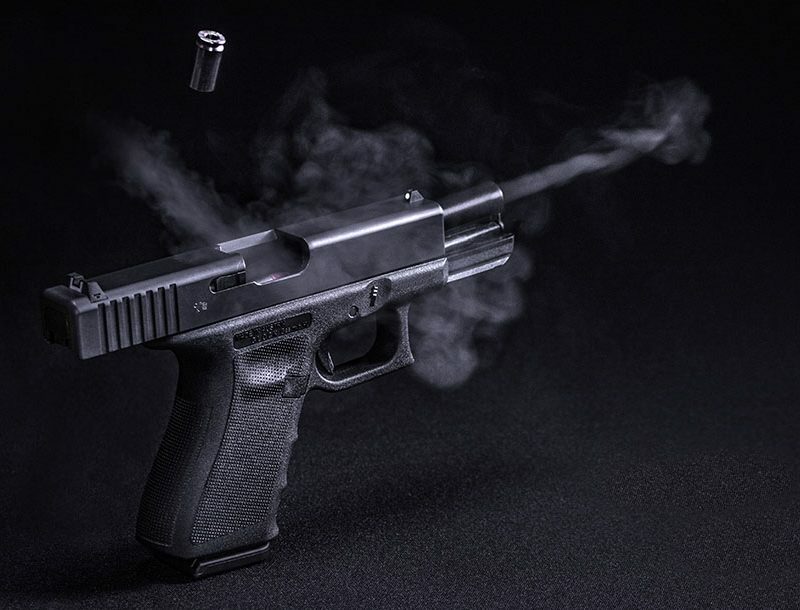 Lasers, in particular, can also help you make a shot if you can’t use your iron sights, or your position precludes using an optic. 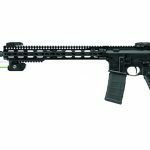 That’s why we’ve rounded up some of the best tactical AR lasers and lights to help you gain every possible advantage. 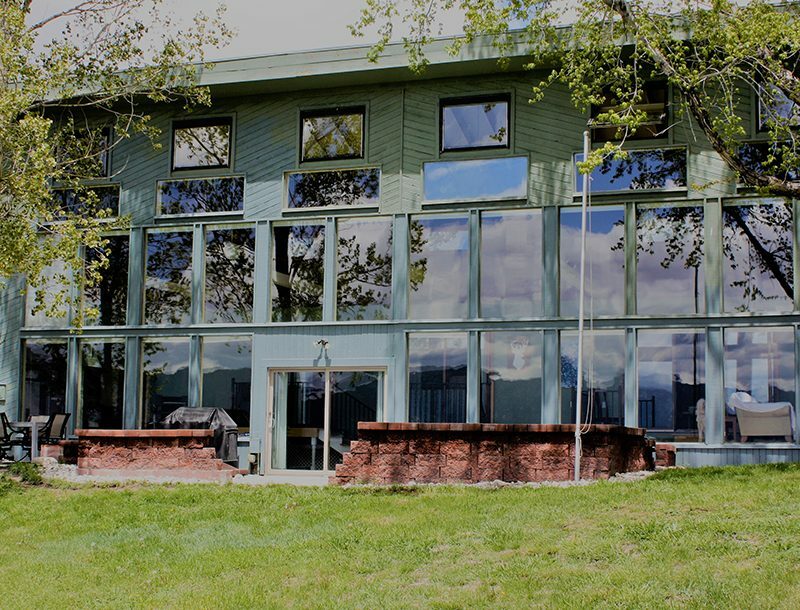 For more information about the AR lasers and lights featured in the gallery above, visit the following sites. This article is from “Black Guns 2018” magazine. To order a copy, visit outdoorgroupstore.com.